So I figured with Black Friday just around the corner I'd start something for any of the great deals everyone will be finding. I dont know what will be out here yet but I'm sure there will be something someone will want. Rocket City Wranglers are going on a ride. We will be heading south on Saturday and coming back Sunday. The park is staying open until midnight for a night ride Saturday night. They have camper/RV hookups and primitive camping. $11.00 for a spot for your tent. We are going to be grilling out at the pavilion. RCW is providing hamburgers and hotdogs. This is going to be an event you won't want to miss. So we can have an accurate headcount, please let us know if you are in or not. We are getting ready for our October ride. It is going to be October 14th at Hawk Pride towards Florence. We will be joining Bama Offroad group. This is a great park with plenty of trails for any level Jeeper. Hope to see everyone out there. Post up here letting us know you will be there. I have been looking at ball joints lately since I am about to do sleeves and gussets and wanted to get some input from everyone else. I have been looking at the Teraflex HD joints but would like some that are maintenance free. While driving around without doors I find it difficult to see cars around me without the mirrors. I didn't want to buy new mirrors to have while doorless however I ended up buying a couple small mirrors to try and see how they work. Now where do you put mirrors that usually stick to mirrors without having mirrors? In light of the newly acquired wheels I have been looking for a set of flares or cutting mine. I was looking on YouTube at how to videos to see the different techniques and an ad popped up for flat steel fenders. I clicked on it just out of curiosity and ended up ordering them. They are steel which was a big plus and they were only $170 for the complete set with hardware. I figured for that price it was definitely worth it. If you use promo code when checking out "10-OFF-SALE" without the quotes you save $10. So I was walking into work this morning and had to stop and snap a quick pic. I thought this could be short lived or interesting. 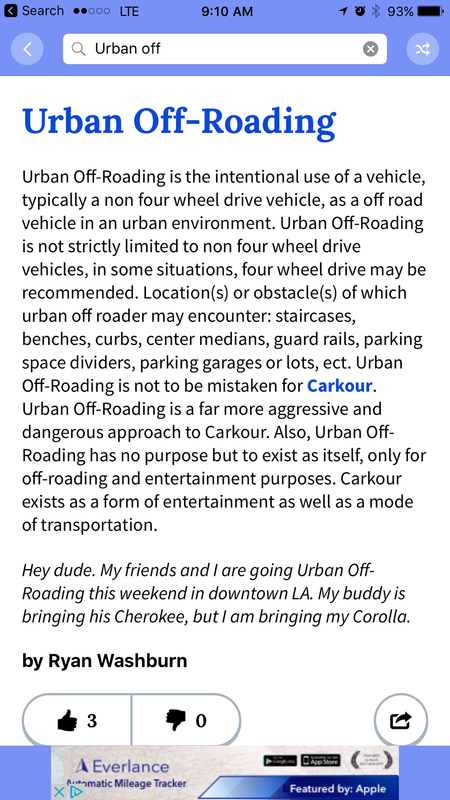 What are some of the pics you've taken of urban off-roading. In case anyone was interested. Change of plans. Since most people are not able or willing to travel the 2.5 hours to Choccolocco Mountain, I have decided to change the location to Iron Gap. This is a trail that starts in Winchester Tennessee, about a 45 minute drive and ends just north of holly tree. This includes a couple water crossings I don't think is deep enough to cause stock jeeps any problems as well as some complicated off shoots where we can have fun. The entire trip should take 45 minutes there plus about 3-4 hours for the ride plus any additional time just goofing off on the trail and then 30 minutes back into hsv. I hope that this will allow more people to go and still be a fun ride to somewhere most haven't been before. The Choccolocco Mountain trip will be pushed back to a later date. Let us know if you will be available. Our July ride is going to be a little further away. We will be going to Choccolocco Mountain this time. It is located in Jacksonville, Alabama. This is way down 431. They have primitive camping and RV hookups. As usual post if you are going or not. List will be updated as required. Does anyone have a hook up on propane? I have a tank that I need filled. It's a 100lb cylinder and I know I can go to u-haul or heritage propane but figured I'd start here. With all the different types of vehicles people work on, or different types of things, and odd jobs, etc. It's almost impossible to have a tool for everything. I figured this thread would be a good place to post if you need something. This doesn't have to be tool related only, but if you need something, maybe someone has what you need and can loan it out instead of you having to go buy a new one. This also applies to skills. If you don't know how to do something and someone else does, maybe they can help. 1.) If you borrow something return it within a reasonable time. Don't borrow something if you don't need it for another six months down the road. 2.) If you borrow something and you break it, it is up to you to replace it with like or newer replacement. 3.) If you borrow something and the person that you borrowed I'd from needs it back, it should be returned as soon as possible. After all it is theirs. 4.) Dont lend something broken or about to break with the intention that it is going to be broke and replaced. 5.) If you have something of someone's don't lend it to a third person without going through the person it was narrowed from. These rules will be changed as needed, however don't take advantage of it or the people involved. Today from 4-8 you can get subs for $1. I may have an option to trade my 35-12.50-18 for a set of 38-13.50-17. My question is how long can my D44's hold up without upgrading or fixing things? Has anyone run 38" on their jeep and what size lift do you have? I currently have 1.5 or 2" spacers so I'm not too worried about BS. Just found out the greatest news and wanted to share with the world. After leaving luckydog today I took on the challenge of changing my rear brakes. In doing so I found out two things. One kind of important the other was life changing. 1.) brakes as many as I've changed usually have a pair for each side. The difference is a spring on the inside pad that squeals when the pad gets low. This was not unknown but confirmed. 2.) It is possible to change brakes WITHOUT removing the wheels. This is pretty awesome and didn't know if this was known or common. Anyway that's all. Please use this information responsibly. Over the weekend I changed out my track bar, drag link, tie rod, and old stabilizer for new upgraded parts. I went with a brand that I've used before but not widely known in the off-road world. I went with a company called SPOHN Performance. The rods I got were 1-3/4" OD and 3/8" wall thickness. These things are BEEFY. Almost twice as heavy as the stock units. 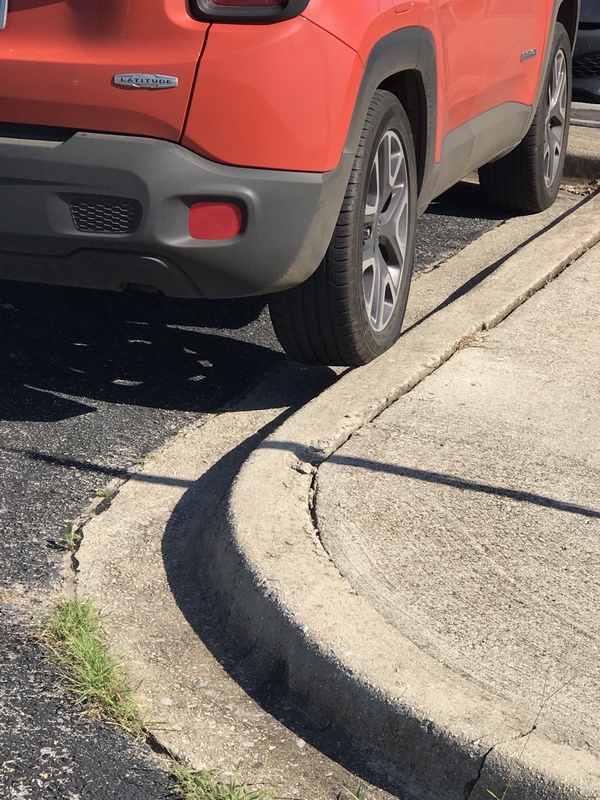 Anyway when I was done I knew I needed a front end alignment. I called around a couple places and ended up going to Woody Anderson Ford on Jordan. Yeah, yeah, yeah, I went to a ford dealership to have work done on the jeep. I brought it in and they immediately brought it in on the lift. I just changed the oil so a rotation was also in order. They did a 5-tire rotation which they normally don't do. While they pulled the tires off I also had them balance them for me. When he was done he went through and double checked all my nuts and bolts and made sure they were torqued correctly. They went and pulled up specs from SPOHN to match them to. (This was awesome). They also went and greased all the fittings on the ball joints. They got done with that and put it on the alignment rack and started working. Got everything worked out and within the specs that SPOHN suggested. They were great all around. The pricing with everything was cheaper than just the alignment at most other places. And they don't charge tax on any labor which also helped drive the price down. I know people have had a less than stellar time at other dealerships but this one went above and beyond and turned out to be a great place. This wasn't my first time there and I would definitely go back.